Factory tested, pre-terminated 24 pair Cat5e cabling solution. 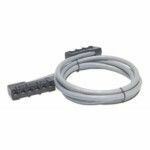 24 Pair, Cat5e PVC cable, with 6 pre-terminated connections in lengths from 5 to 75 feet. On demand rack to rack network cabling.